Cars Eaten Alive in Russia! What in the world is the reason that Samara, city in Russia, is getting 'eaten alive' by enormous sinkholes? 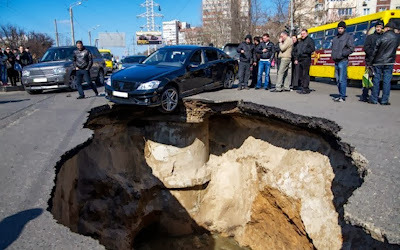 Cars, buses, and trucks are vanishing underneath the earth ingested up by massive sinkholes! This is completely and utterly wacky! Why would all of these sinkholes have just spiraled up within the last few weeks? Somewhat is going on to cause all of this, but what can it be? These photos may look like they taken from an apocalyptic horror film or some strange Photoshop work, but these are as true as ever, and they become a daily reality for residents in a Russian city named Samara.